It was not long ago that I saw a similar spike in the email volume when Cyprus, a eurozone country, proposed a large tax on bank deposits which amounted to a proposal of partial confiscation of private property. And then there was the news that central banks bought more than $3 billion in gold in 2013. The chart explains why gold does not go up when fundamentally events are occurring that should cause a pop of several hundred dollars in gold prices. Please click here to enlarge the chart. Before I explain the chart, let us analyze the three events described above. According to the data compiled by UBS, central banks bought $3 billion worth of gold in the first two months of 2013. South Korea bought 20 metric tons, Russia bought 19.2 metric tons, Kazakhstan bought 6.6 metric tons, Indonesia bought 1.9 metric tons, Bosnia bought 1 metric ton, and Azerbaijan bought 2 metric tons. Such massive buying by a number of central banks alone should have caused gold to move up to $1900 but it did not. The founding principle of the eurozone was that it would have a common currency. But now a euro owned by a German is not the same euro when owned by a resident of Cyprus. When faced with mounting opposition, Cyprus abandoned its plan to impose large taxes on bank deposits. Yes you are reading it right – a plan of taxes not only on interest but on the total amount of deposits. This tax amounted to confiscation of private property without any compensation. After abandoning this plan, Cyprus imposed strict capital controls. Initially people could withdraw a maximum of $300 euros each day from banks. People could not take more than 1000 euros out of the country and overseas credit card transactions could not exceed 5000 euros per month. Capital controls have now been eased but still remain onerous. Large depositors in Cyprus are likely to lose a large percentage of their money. Common sense dictates that what has happened in Cyprus should have sent shivers down the spines of investors and they should have flocked to gold, but they did not. Even though the probability of a nuclear conflict with North Korea remains low, it cannot be totally ignored. North Korea has a new young inexperienced leader in Kim Jong-un who is pushing to the edge to prove to his population that he is strong. Is it conceivable that this inexperienced leader will not pull back from the edge and start a war? Under these circumstances, gold should have spiked, but did not. If you were privy to the result s from complex computer algorithms at The Arora Report, gold behavior would make perfect sense to you. Different types of participants leave different types of footprints when they trade. Over years, we have refined our algorithms to detect such footprints from trading data across the world. The chart shows the zone where the vast majority of buying was by the momo crowd. The momo crowd in gold is a relatively recent phenomenon. Gold bugs and the gold momo crowd are often confused. The reality of the differences between the two groups as I have assessed from a large number of emails is stark. Gold bugs tend to be intelligent and well-steeped in economics, especially monetary policy. They understand the arguments against gold and silver. Gold bugs tend to be long-term-oriented and disciplined investors. As an example, in 2011 I did not see gold bugs mortgaging their homes and buying silver on margin. The gold momo crowd is another story. Gold momo crowd buys gold and silver simply because everyone else in their social circle is buying gold and silver, they think it is going up, and they are scared of monetary policy pursued by the Federal Reserve. The gold momo crowd keeps up the ruse that they understand inflation and history, but in reality, my experience is that unlike gold bugs, their knowledge is superficial. According to our algorithms, the zone outlined with red on the chart is the zone where smart money has been consistently selling. Until now, the momo crowd has not been selling even though on the average the momo crowd is sitting on a loss in gold. To make matters worse, the momo crowd has continued to buy gold during most of the decline since gold hit $1904. Further, the momo crowd has consistently engaged in bizarre behavior of buying on good news and buying on the news of low inflation. Traditionally gold is a hedge against bad news and rising inflation. From the large number of emails I receive, the momo crowd contends that it is different this time. My 30 years of experience and deep study going back centuries shows that any time a specific group contends ‘it is different this time,’ it is a danger signal. Yesterday was the first day in over two years that our algorithms detected slight selling by the momo crowd. The danger here is that if gold does not bounce here, the momo crowd will panic and sell. The result will be a flush leading to the target zone shown on the chart and smart money will be laughing all the way to the bank at the expense of the momo crowd. Of course, there is no guarantee that such a scenario will come to pass, but it is highly probable if there are no new major fundamental developments to support gold prices. The first step is to decide if you are a long-term investor or a trader. If you are a long-term investor, there is no need to panic. According to my ZYX Change Method supplemented by ZYX Asset Allocation Model , the very long-term view on gold is positive. 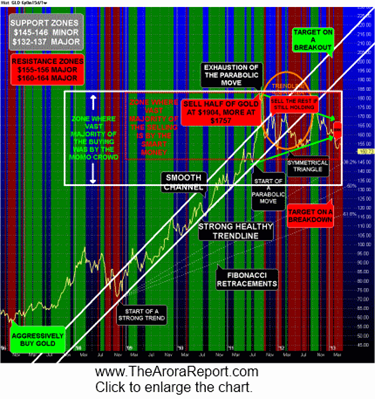 In the very long-term, gold is likely to exceed the target zone shown on the chart. As the chart shows, these same models helped us aggressively buy gold in $600’s and then helped us sell half of gold at $1904 and the rest at $1757. The same models gave a signal to aggressively buy silver in the $17 range and got us out at the top very near $50. Since selling the investment positions in gold, these models told us that the time for medium to long-term investment in gold was over and it was time to be a trader. Since then we have been taking only short-term trades in gold and silver. The foregoing demonstrates why it is so important to decide if you are a trader or an investor. Investors are in for the long-term whereas traders are more concerned about day to day movements. If gold dips into the zone shown as ‘target on a breakdown,’ then barring any new fundamental developments, it will be the next great buying opportunity for long-term investors.